In knowing effectively nothing about this project, a quick perusal of their website gave some clues they may be London, United Kingdom based. But regardless of the truth of this, the promo blurb for this release initially captured my attention: “Swirling drones become a sonic lens which drifts and roams through the currents and threads within the contemporary landscape. Mingling amongst the town square demonstration, flipped upside down through the cameras into the news media rooms and editing suites, dragged up into helicopters looking down into streets and homes, then bounced across the globe by satellites floating in the atmosphere. Spam bots and malware, encryption data, analysis of YouTube, uploads and text messages. 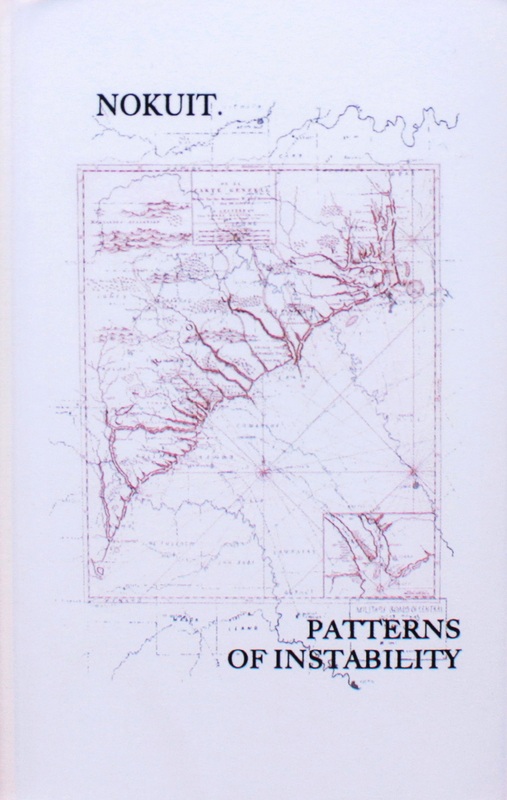 Rather than focusing in on any specific geographical event, ‘Patterns of Instability’ takes a widescreen approach to our contemporary age of discontent and digs deep into timeless feelings of frustration”. In then relating this description back to London, it certainly reflects the pervading ‘angst malaise’ riddled atmosphere I experienced during my five years of residency there in the early 2000’s (and also included the observation of the Government’s overt obsession with public CCTV surveillance – which is now found within the majority of the UK’s urban spaces). But I digress from the review at hand. Musically speaking the tape features two untitled and lengthy tracks (24 and 21 minutes respectively), which is dark ambient mixed with post-industrial sonic expression. Being broadly soundscape orientated in its construction, there is a darkly meandering and at times paranoid atmosphere at play. From the opening of track one, a dourly muted and minimal synth line provide a semblance of fleeting melody, while distant crowd noise, creaking gates and other sparse industrialized debris engenders a distinct, slightly detached ‘Kafkaesque’ tone. Yet things evolve substantially from there, as at around the 10-minute mark it tonally shifts into a soundscape of forceful, semi-melodious drones. When coupled with sampled choral vocals and an Army marching drill, it all combines to (fleetingly) sound like a more industrialized version of Les Joyaux De La Princesse, while the final segment of the track then evolves towards a doom riddled dark ambience with strong orchestral styled synth pads. On the flip side, the second track opens with a passage of animated and driving sonics based around a multitude of sweeping layers and pulsing bass tones, further mixed with crowd chatter and other field recording elements. Yet soon enough these falls away to feature another sparse yet forceful melancholic synth line, and from there slowly evolves into a more abrasive and textural sweeping soundscape. The final concluding segment features, muted noise, a lone and sustained piano note and backed by layered media voices (and while the voices are spoken to sound serious and earnest, the juxtaposed mood makes them sound decidedly dishonest and/ or untruthful in their message). Perhaps it is not too much of a stretch to describe Patterns of Instability and an abstract but very effective sound-score to a modern dystopian film (think Children of Men or similar). As such this album is a varied and nuanced, mood driven work, which is highlighted through its meticulous sonic detailing and post-industrial/ experimental compositional flair. Limited to 100 pro-duplicated tapes, and fold out J-card, this is absolutely worth your while in investigating further. This entry was posted in dark ambient, experimental, NKT by noisereceptor. Bookmark the permalink.